Galaxy S II feels very light, especially considering its size. 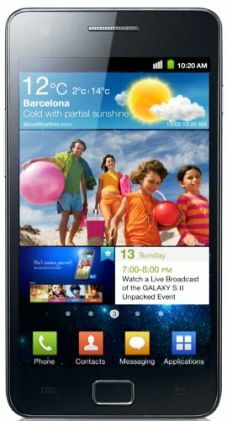 Galaxy S II comes with a 4.27-Inch Super AMOLED+ screen and runs on Android 2.3 Gingerbread customized with Samsung’s Touchwiz 4 user interface. Galaxy S II will have an 8 megapixel camera and 1GB RAM. Samsung Galaxy S II phone comes with Super AMOLED screen, which is the highlight of the phone. The new Samsung Galaxy S II phone is taller by around 0.3 inches as compared to Galaxy S but its weight has come down by three grams. The film Nanban is produced by Gemini Film circuit. Nanban is the upcoming tamil movie directed by S.Shankar. This movie has Vijay, Jeeva, Srikanth, Ileana and Sathyaraj in the main roles. The music director for the film Nanban is Haris Jayaraj and Na Muthumumar is writing the lyrics for the film. Antony is the editor and Manoj Paramahamsa is the Cinematorapher. Latest New is that: Along with Vijay, Jiiva and Ileana are also taking part in the shooting. Nanban team is expected to shoot in Chennai city for another week. Once the shooting is over Director Shankar is planning to shoot the songs next and the entire Nanban unit will fly to Spain to shoot the songs.